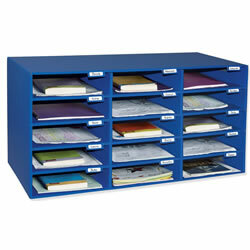 Help keep your classroom neat and efficient with Kaplan's selection of organizer and storage products. Choose from a variety of classroom supplies, desk organizers, and storage bins to help provide your students with a well-organized learning environment. 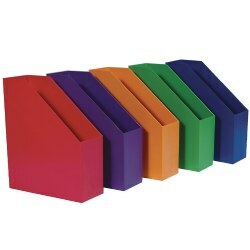 Book file is made of sturdy, durable plastic. Tall sides keep books upright. 9 1/2"W x 11 1/2"H x 3 1/2"D. Made in the USA. 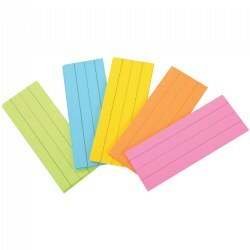 Multi-color word strips are 3" x 8" with lines. May be used as flash cards. Package of 75. 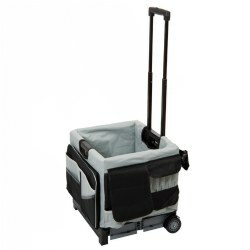 Durable plastic cart with wheels and telescoping handle for easy mobility. The canvas saddle bag cover has multiple storage pockets on all sides designed to hold a variety of supplies. Zippers and loop-lock closures secure supplies for traveling. Folds flat to 3" for easy storage. 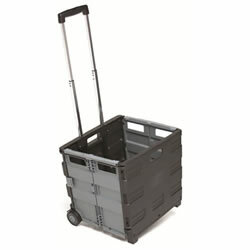 Cart measures 16 1/2"L x 15"W x 16"H. Cover is 17"L x 16"W x 2 1/8"H. Holds up to 65 lbs. A "cool" way to spruce up your classroom while cutting down on noise. Just slip these socks on the legs of your chairs and instantly transform your room. No more scratched floors! 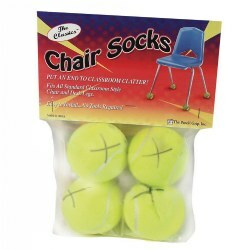 Available in a set of 4 socks for one chair, 24 socks for 6 chairs, and a set of 96 sliders for 24 chairs. 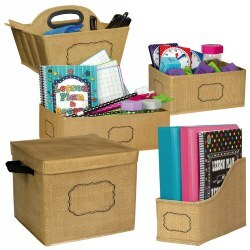 A great way to keep supplies organized and within reach! 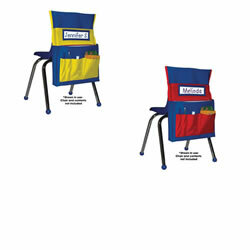 Slips over the back of most preschool and early elementary chairs for extra storage and convenience. Heavy-duty, washable canvas has PVC coating for added durability. 15" wide x 19" high x 2" deep, fits seat back up to 30" around, measured 6" from the top. Accommodates a variety of general purpose storage needs. Lifetime warranty, large label area on front. 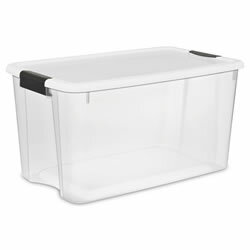 Measures 16"L x 12 3/4"W x 6"H.
These clear latching boxes are perfect for storing a variety of smaller items and stacks to utilize space. 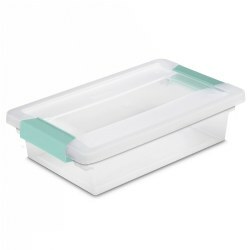 The clear lid and base allow contents to be seen from any angle. 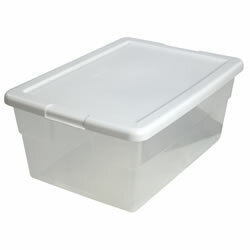 Tight-clasping, tinted latches hold the lid to the base so that contents remain securely contained. Small Clip Box: 2 2/3"H x 6 5/8"W x 11"L. Letter Size Clip Box: 3 1/4"H x 11"W x 14"L. Manipulative Clip Box: 5 3/5"H x 6 3/8"W x 11"L. Latch color may vary. This basket has a label holder along with handles to make it easy to carry. 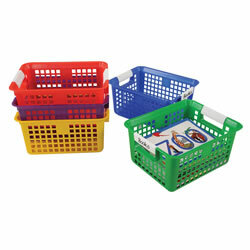 Super for the classroom for storing books or supplies. Measures 6"H x 12 1/4"L x 9 3/4"W. Single basket. Books not included. 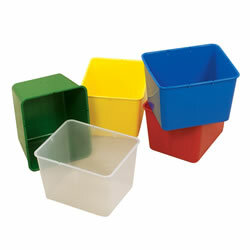 This storage tub is made of soft flexible material. 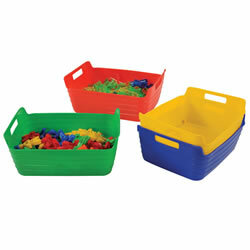 Perfect for all types of manipulatives and learning supplies. Measures 5 1/4"H x 12 3/4"L x 10"W.
This bin and lid set can protect and organize manipulatives easily and store student files. 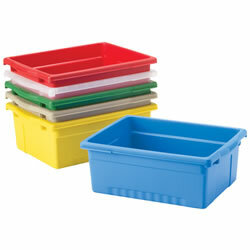 Perfect size for classroom storage solutions. The lid fits snug and allows the bins to stack. 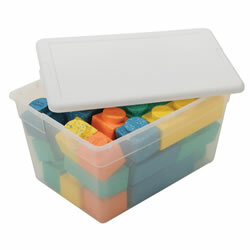 Measures 5"H x 13"L x 10 1/2"W.
Store large manipulatives or children's belongings in our oversized cubbie boxes. Choose from five different colors. 12 1/2"L x 10 1/2"W x 8 1/2"H.
The perfect size caddy for your pens, paints, brushes. 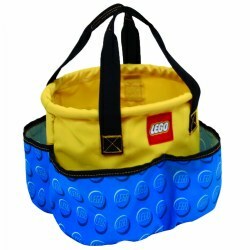 Great for toting school supplies, craft supplies, etc. 9 1/4" x 9 1/4" x 5 1/4". 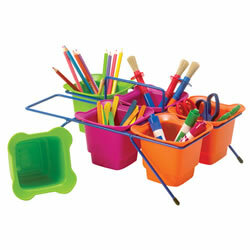 This wire caddy is a great way to keep art supplies or other classroom materials neatly organized and accessible. Includes six tiny tubs: two green, two purple, and two orange. Measures 6"H x 13"W x 8"D. Contents not included. Strong and durable corrugated storage unit! Easy to assemble classroom mail box with 15 individual mail slots. 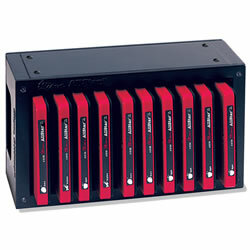 Slots are 12 1/2"D x 10"W x 3"H and designed to hold a variety of material. Durable plastic cart with wheels and telescoping handle for easy mobility. Cart accommodates letter or legal size folders, hanging files or binders and features built-in hand-grips for easy moving and lifting. Double rails lock sides securely. 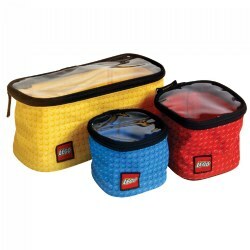 Folds flat to 3" for easy storage. Cart measures 16 1/2"L x 15"W x 16"H. Holds up to 65 lbs. A versatile display option! Present flash cards, artwork, word cards, student work, and much more in any room. 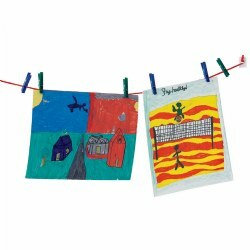 Includes two 50' lengths of strong line in assorted colors, 48 clothespins in assorted colors, four adhesive wall mounts, and idea-packed activity guide. 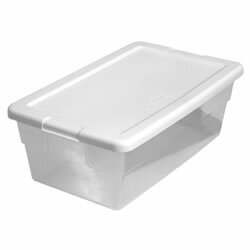 70 quart storage box feature durable latches that attach the lid securely to the base to ensure that contents remain secure when stored. The see-through base allows contents to be easily identified, and multiple bases are able to stack on top of each other. 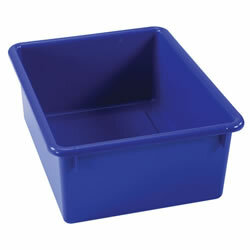 26 1/4"L x 16 1/4"W x 14 3/8"H.
This container features a see-through base allowing contents to be easily identified. Recessed handles for easy lifting and carrying. The lid has comfortable grips and an indexed surface area for exceptional stability when stacking multiple units. Measures 4 3/4"H x 8 1/4"W x 13 1/2"L.
Die storage rack will hold up to 10 Super Star dies. They will stack on top of each other. Use on table top or wall mount. Black finish. 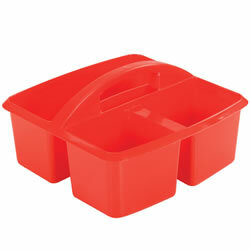 Measures 7"H x 5"W x 11 1/2"L.
This container features a see-through base allowing contents to be easily identified. Recessed handles for easy lifting and carrying. The lid has comfortable grips and an indexed surface area for exceptional stability when stacking multiple units. Measures 7"H x 11 3/4"W x 16 5/8"L.